This page provides you with Principal resume samples that you can use for inspiration in writing your own resume, or for creating one through our easy-to-use resume builder. Below you'll find our how-to section that will guide you through each section of a Principal resume. Perhaps you have a passion for passing knowledge to students. Maybe the job of a principal sounds quite appealing to you or maybe you have been in the education sector for quite some time and you feel it is time for a very good upgrade. Let’s say you just came across a publication which requested the services of a principal in a school. Now, you looked at the requirements for the job and realized that you are very compatible with all of them. The only problem which exists now is that you don’t know how to compile all the details about your job to fit into the resume. Do not stress yourself as we have come to save the day with the best principal resume sample on the web! We know all what you require and we are prepared to help you compile that standout resume that would help you secure that job. Don’t be discouraged by the different details which you have to deal with in the resume. Let’s start the whole journey gradually. 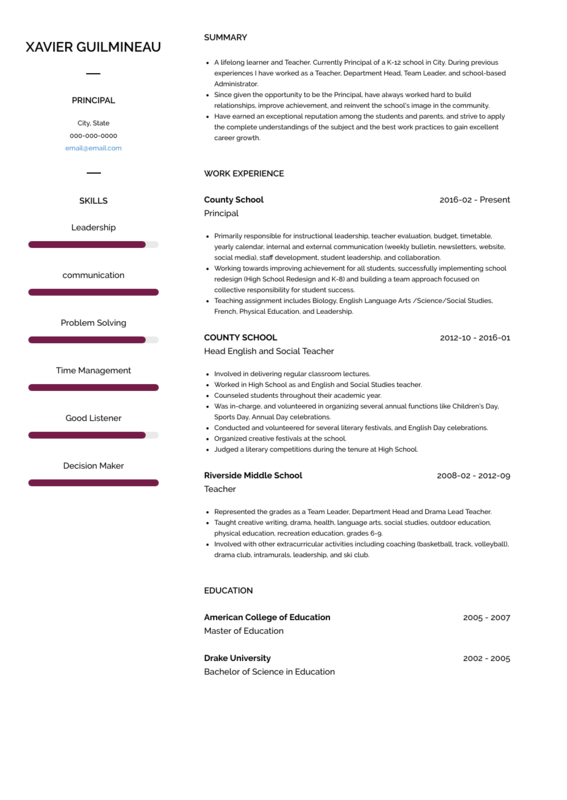 How to Write Resume for Principal? As a principal, there needs to be an amount of responsibility attached to your work. The professionalism you would display should also be on a very good level. This professionalism and sense of responsibility must be obvious in the way you write your resume. When deciding on a layout to make use of in your resume, go for something quite simple and professional. The goal is to impress your recruiter and no employer would be impressed by finding too much colours in a principal resume. Next, you have to pick a font which is compatible with your layout. By picking a compatible font, it means that you have to pick something which has a very similar colour and blends well into the resume. Avoid the use of more than two different font types. Your resume is not to look to artistic. Another important thing that determines the appeal of your resume is how well spaced it is. Your resume should have proper amounts of spacing and should also be divided into different segments using proper headers. Make sure everything about you resume has a professional tone to it. Last but not least, don’t forget to save your resume as a .pdf document: Microsoft Word is an enemy and won’t keep your layout intact! amount of time and with very short pieces of information. The summary should be a brief description of all the important details in your resume. Any detail you consider as most appealing about yourself should be put here. This section should serve as a highlight and an insight for the employer into your person. List all your skills that make you qualified for the position. Use a smart or pompous tone in the summary. Talk as if you are better than the recruiter. Your work experience section should be written in reverse-chronological order, beginning with your most recent role and working backwards. Use a bulleted list in each entry to make your experience easy to read and understand, focusing on your quantifiable achievements in each position rather than responsibilities. For more tips on writing the best work experience for a principal like you, please check out our detailed resume guide. Many principal positions require a Bachelor’s degree in Education, though some principals will have Master’s degrees in other disciplines instead. Either way, an Education section is an important part of a Principal resume. Your education section should include the degrees you have earned and the names of the institutions you attended. If you received any prestigious academic awards during your studies, they can also be included, as well as any important projects or memberships that are relevant to the position. A great cover letter has never hurt anyone! Match a brief one-pager with your resume will give you an advantage over other candidates. Follow our tips here. Make sure your references know you’re looking for a job! Badmouth any of your peers! If you are also looking for the best Principal resume templates, check this out these masterpieces we have been working on here : many professionals like you have successfully used it to take their career to the next level.